My cousin got a new puppy and a new kitten so I wanted to say Congrats! Now this is where I KNOW my card making is an advantage. 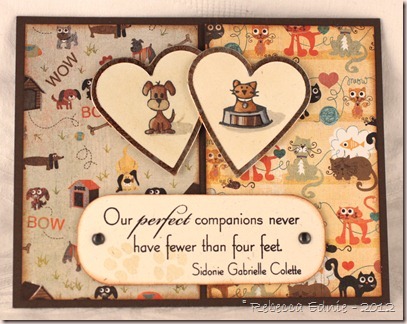 Try and find a card in Hallmark that’s a congrats on your new cat AND dog in the same card! Hah! Take that Hallmark! I used Max and Whiskers paper, specifically half puppy and half kitty papers. 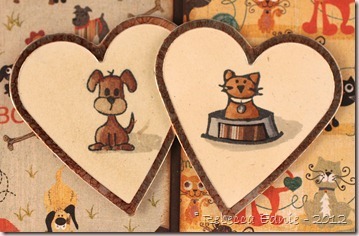 The heart tags are those Making Memories frames to which you add your own paper in the centers. Worked out well except I wanted warmer coloured+-frames than the silver they come in. So I used a Copic marker on them tapping the side along the frame. So now it looks antiqued/distressed. Paper: DP-Max and Whiskers Basic Grey, chocolate CS-PTI, natural ivory-SU!